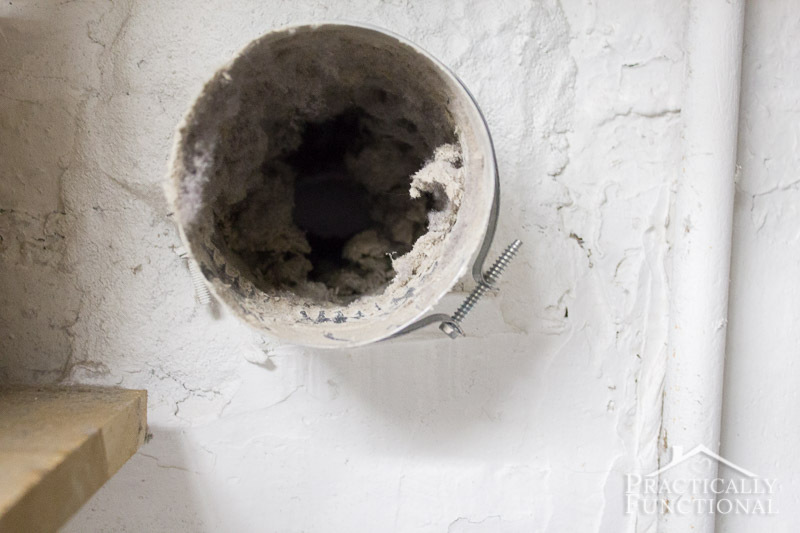 How To Clean A Dryer Vent - Remove lint and prevent fires! 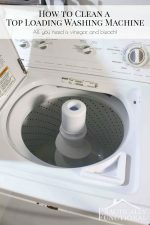 Home > Cleaning > Cleaning Tips > How To Clean A Dryer Vent – Remove lint and prevent fires! 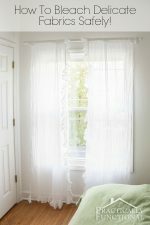 How To Clean A Dryer Vent – Remove lint and prevent fires! 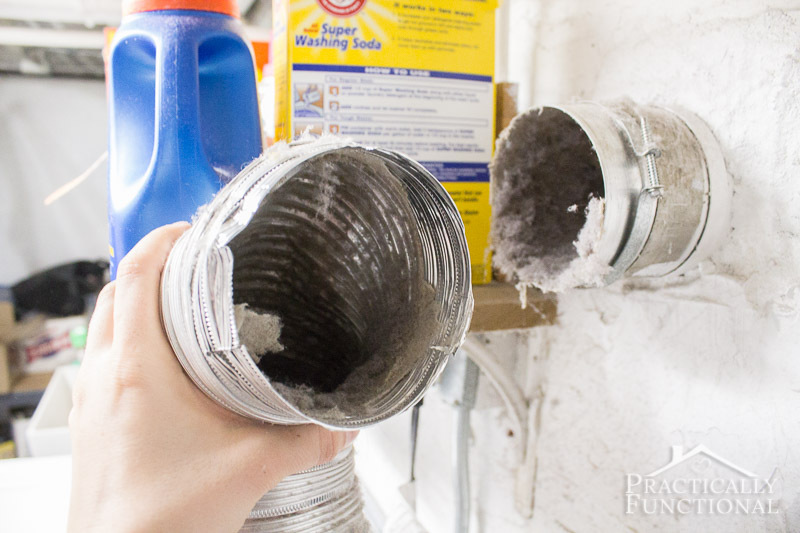 Did you know you’re supposed to clean your dryer vent once a year?! I had heard that before, but I figured that was just a manufacturer’s recommendation, and those always seem a little excessive. But it turns out there is a GREAT reason to clean your dryer vent once a year; it helps remove lint build-up and can prevent fires! 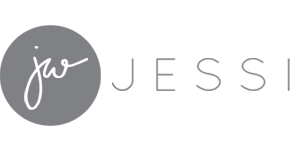 When the heat turns on in the winter, it dries out the air and everything gets staticky. Static electricity is annoying when you accidentally shock yourself while walking around the house, but it can also be incredibly dangerous if it ignites lint that has built up in and around your clothes dryer. You can hire a professional to come clean your dryer vent, but that gets expensive, and you can do it yourself in about fifteen minutes! 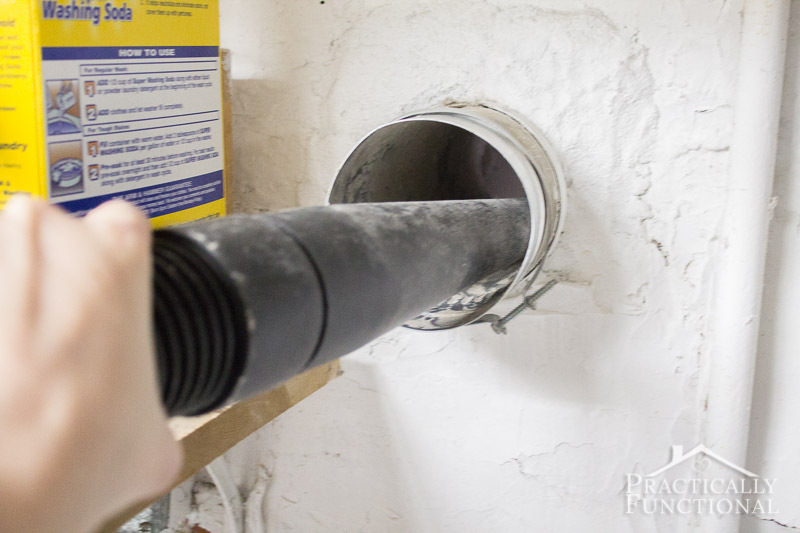 Today I’m going to show you how to clean a dryer vent to remove any lint build-up and prevent the possibility of a fire! It’s actually quite simple to clean your dryer vent, as long as you have access to the vent hose. 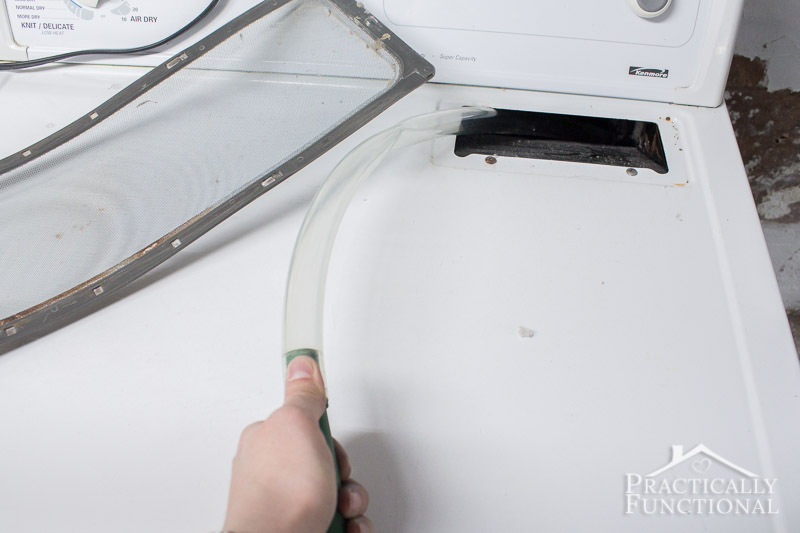 If you can see the entire vent hose from where it connects at the back of your dryer to where it goes out the wall to the outside, then you can clean out the lint build-up yourself! The first thing you need to do is pull your dryer away from the wall so you can access the dryer vent hose. 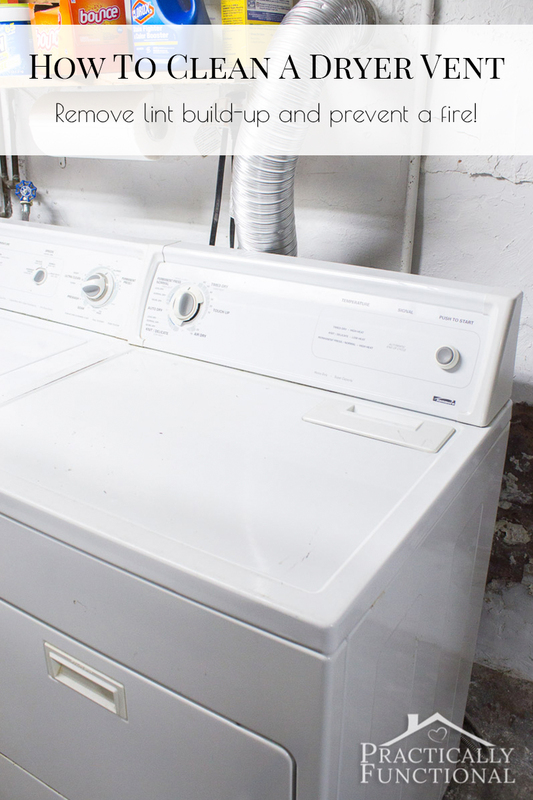 Unplug your dryer, and turn off the gas if it’s a gas dryer. Wait, what?! PAUSE! When I pulled our dryer away from the wall there was a GIANT hole in the dryer vent hose! Ok…this is not supposed to happen folks! But it definitely explains why our laundry area was covered in so much lint! For 99.99% of you, when you pull your dryer away from the wall, you will see the hose, and some lint, but the hose will be fully intact, as it should be. I have no idea what happened to the dryer vent hose, but I’m sure glad I decided to clean the dryer vent now and didn’t wait any longer! So it turns out I had to replace my entire dryer vent hose rather than just cleaning it, oops. But don’t worry, the steps to clean your dryer vent and hose are basically the same whether you just clean out the hose or have to replace it entirely. So for you guys without giant holes in your dryer vent hose, this whole thing will be super simple! 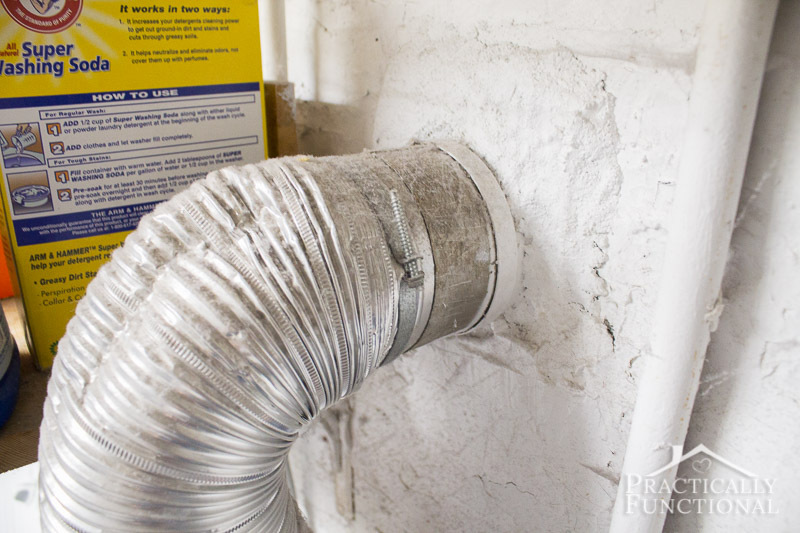 Once you’ve pulled your dryer away from the wall, find the exhaust port where the dryer vent hose attaches to the wall. We’ve lived in this house for two years and this is the first time I’ve cleaned the dryer vent, but based on how much lint was built up in the hose and in the port, I imagine the previous owners hadn’t cleaned the dryer vent for a while either! Yikes! We’re extremely lucky none of this ever caught fire! 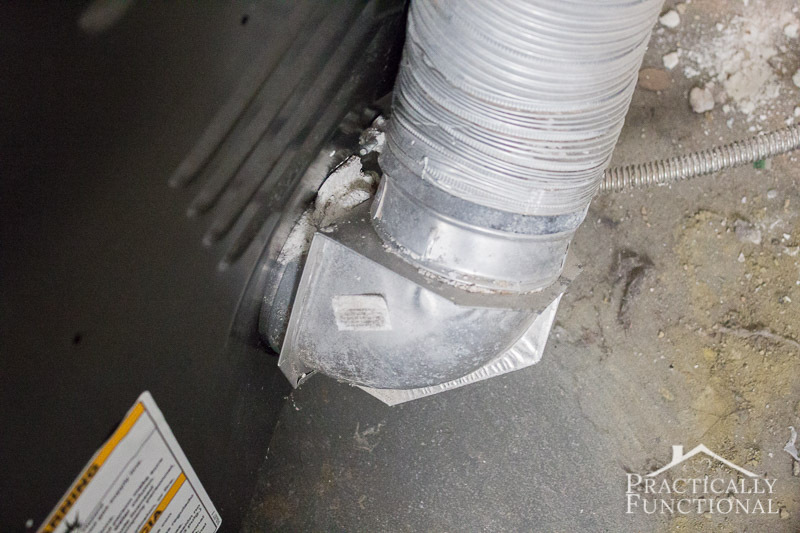 Once you’ve removed the dryer vent hose from the wall, you need to remove the other end from the back of your dryer. You should see another clamp at the other end of the hose; remove it and pull the hose away from the port at the back of the dryer. Now you need to clean out all the lint from the hose, from the port in the wall, and from the port at the back of the dryer. I used my dryer vent trap brush to knock the lint loose from the walls of the port. As for the hose, it can be up to ten feet long, so the dryer vent trap brush won’t be long enough to reach everywhere. That’s where the dryer vent duct brush comes in handy! It’s super long, and flexible, so it can snake through the entire dryer vent hose and push all the lint out the other end. Once all of the lint is knocked loose, grab your vacuum and the lint remover vacuum attachment, and vacuum up all of the lint you can find. 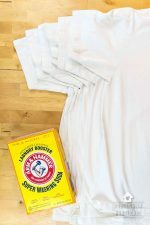 You’ll want to clean out the wall port, the dryer port, any lint you knocked loose out of the hose, and any extra lint that happens to be floating around your laundry area. You might as well vacuum off the back of your dryer and clean up any lint on the floor or walls as well; it’s always better to be clean and safe! 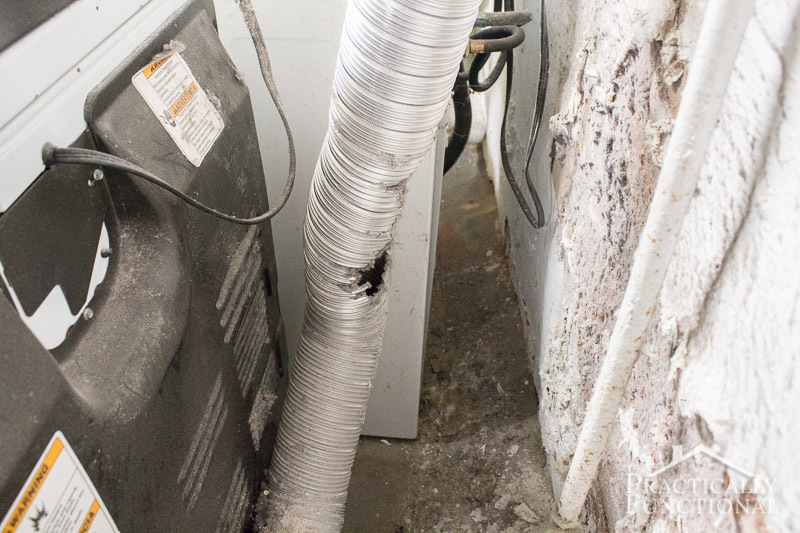 After you’ve cleaned up all the lint, it’s time to put the dryer vent hose back together. Slide one end of the hose over the port at the back of the dryer and reattach the clamp. Then slide the other end of the hose over the port in the wall and reattach that clamp as well. 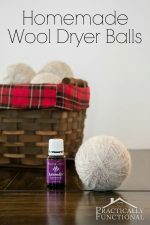 The last step is to clean out your dryer’s lint trap. 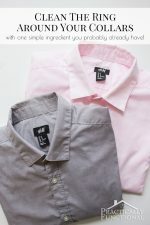 Pull out the lint trap and clean off any lint you see on the screen. 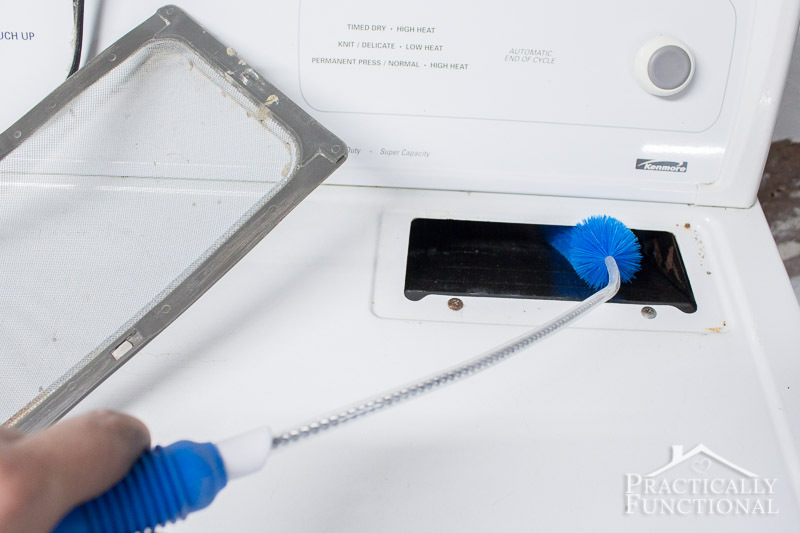 Then stick the dryer vent trap brush into the lint trap and knock loose any lint that’s stuck inside the trap. 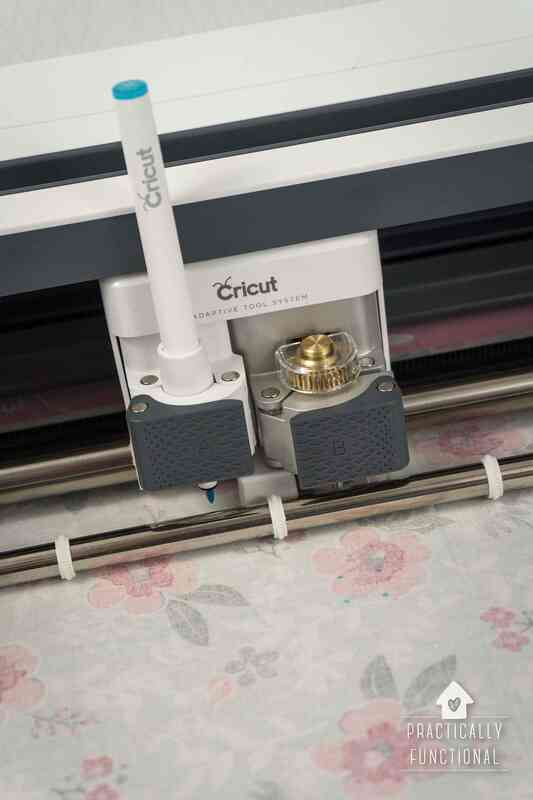 Attach the lint remover vacuum attachment to your vacuum again and use it to vacuum out the lint trap. 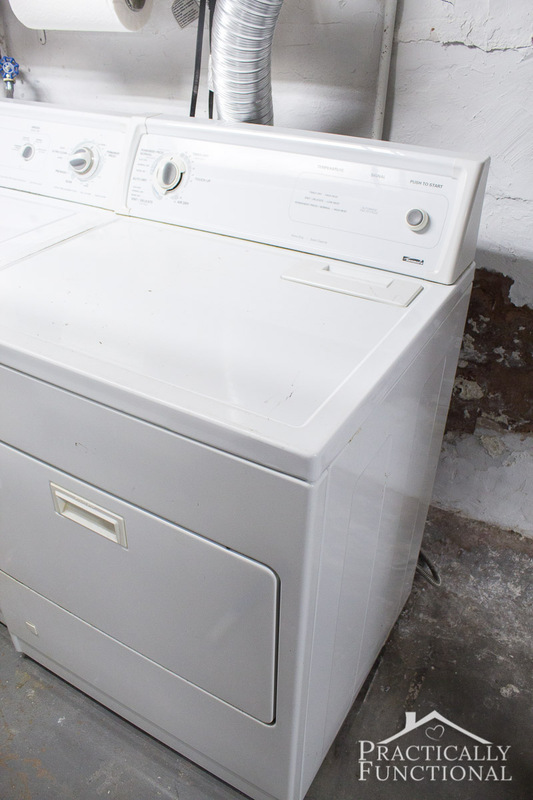 Replace the lint trap screen, reconnect the gas, plug the dryer back in, and carefully push the dryer back against the wall. Be careful not to crush the dryer vent hose! 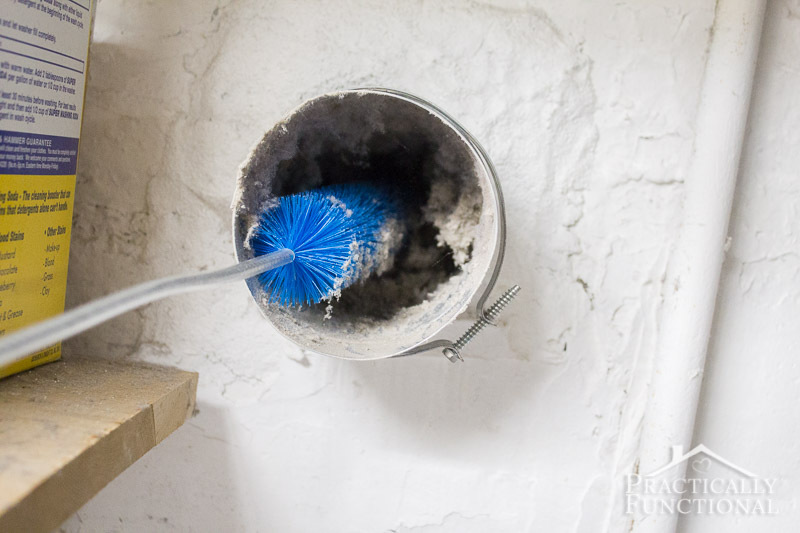 If you have access to the dryer vent exhaust outside, head out there with your vacuum and clean off any lint stuck to the exterior vent as well. And then you’re done! That wasn’t so bad, was it?! Remember, you should clean the dryer vent once a year to help keep lint from building up and causing a potential fire hazard! 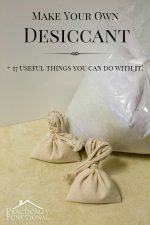 Make Your Own Desiccant & 17 Everyday Uses! Very good advice and great detailed instructions, but I’m concerned about one thing. Shouldn’t disconnecting and reconnecting a gas line be left to a professional? Yes, definitely! You don’t want to go messing with the gas lines unless you know what you’re doing! But there should be a valve on the line somewhere near the dryer and you can just turn that switch to the “off” position to stop the flow of gas until you’re done working. You don’t need to actually disconnect any gas lines, just turn the gas off to your dryer! Thanks for this! I didn’t know it had to be cleaned out. Boy, your laundry area reminds me of MY laundry area! I bet this was a lot of work for you, it looks like it was very worthwhile, too. We recently replaced the dryer vent line with a new one, because it looked just like this one! Good girl, keep up the good work! Ah, the never-ending laundry! At least it’s getting warm now and I can start hanging laundry on the line outside to dry!